Just like the Traditional Burmese, the Traditional European Burmese originate from the first of the breed, Wong Mau, who was imported to the U.S. by Dr. Thompson in 1930. Since she was the only Traditional Burmese, Wong Mau was bred to Siamese, producing litters of both solid and pointed coloration. From then on only the solid colored kittens were used in the breeding programs of enthusiasts to perpetuate the breed. 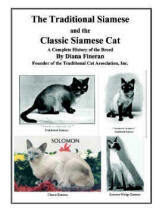 Once the breed was exported to England the same shortage of breeding stock caused the use of more Siamese bloodlines. The result was two different looking “Burmese” on two continents. Using the red gene caused the array of colors accepted in the Traditional European Burmese. The Traditional European Burmese make excellent pets due to their high intelligence, loyalty, and outstanding affectionate ways. They love people, other pets and make top not companions. Excellent health is a natural part of the Traditional European Burmese.